UPDATE 30/01/2017 - the Vampire pack added new occult tags which were needed for these skins to be used so they have new been updated. I have also did a little update for the texture and pinkened the lips so they look more natural. Today I bring you an experiment that came about from the selection of skin colours available in TS4. There is a serious lack of dark skin colours, and the light ones have left a lot to be desired. After a bit of research, diving into the clientfullbuild files, lots of backwards and forwards into the game for testing, hex editing to edit the colour swatches because s4pe threw errors, I finally came up with the lightside and darkside skintones. I could not be more happy with my first, and possibly last foray into the world of TS4 skins. I came away knowing more about the game and some awesome new colours that don't look jaundice or ashy. These are not new skins, they are new skin colours. They are found by default with Maxis skin colours and act as such. They work with all the Maxis skin details such as muscle slider, age categories, weight sliders and are for both genders and all age groups. They can also be a base for custom overlay skins that you find in the face detail sections. Pictured above (and in the archive) you can see previews from a standard basegame skin settings and with Kijiko's skin overhaul. Hopefully you will all find a use for these like I have in tandem with the other TS4 skin colours. 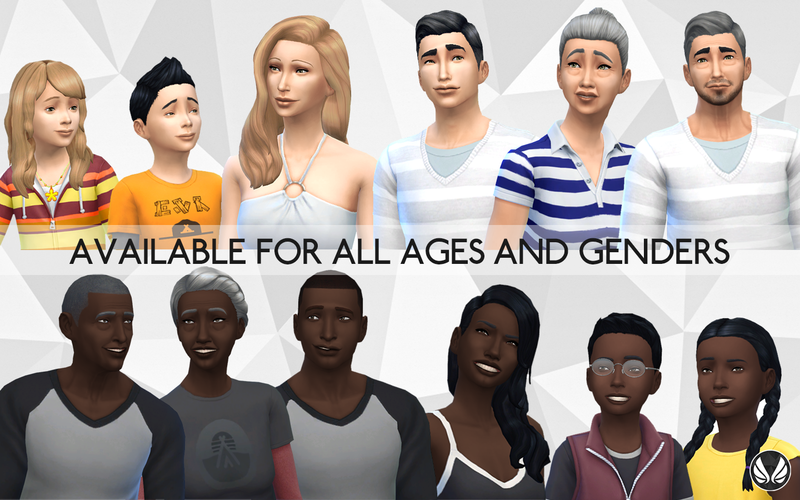 A big shout-out to Snaitf for the tutorial over at Mod The Sims on uncovering the mystery of making non-default skin tones. These have been made to work with Game Version 1.5.139.1020 (game patch prior to GTW release). They may work with the previous game versions, but has not been tested. Note: Due to TS4's genetics system for choosing skintones and the order and position I placed the skintones to separate them from the Basegame selection, if one of your sims uses one of my skin tones and another uses and Basegame tone, then the genetics system dictates that the tone of the children will be somewhere inbetween. The system does not take into account custom tones, so your babies may have odd colour skin differing from the parents. I only found out about this recently, but you should be aware of it. You can solve this by either have both sims use my skin tones, or editing the children in CAS afterwards. I may look at fixing this in the future, but i would need to determine a way of separating my skins while maintaining the way a genetic offspring's skin colour is chosen. The archive contains the package file and the colour preview images. Unzip the archive, and put the package file in your mods folder. They will be found under the skin colour section of CAS. I have provided a merged file containing both light and dark sets, as well as individual downloads if you don't need one of the sets. Thank you for your beautiful work. I always thought the darker colors were lacking in the vanilla. Yes, they work with the latest patch, i had to postpone the release because I needed to make sure they worked. Notegain found the fix quickly so it wan't much of a wait. These tones look beautiful and they are a real must-have. Thank you very much and have a nice day. Thank you for your work on the sims 4 creations. I love them all! Great skintones, but I hate Kijiko's overhauls; it gives even my overweight Sims insane muscle definition. Totally unrealistic and I'm not a fan of that. Everyone to their own. Since these are just skin colours, they don't require any custom content. I showed them since they do look different in game (kijiko's are more defined). That is the great thing about adding skin colours and the new skin system. Colours are separate from body shading so its easier to add colours to work with different overlays and default replacements. Oh my, I don't think I can thank you enough for these. I was so frustrated with EA skin colors! Thank you so much! Ohh these are just beautiful, thank you so much. I just had the odd color skin tone thing happen to me LOL. I used one of the light skin tone, while my sim's husband had base game tan...but the baby came out black! LOL, it was very interesting. I was wondering, how do you change skin tone of the child in CAS, like you mentioned? I really hate that about the skin colours. The way to edit would be entering "testingcheats true" then "cas.fulleditmode" then shift click on the sim you want to edit. Do be aware though, occasionally some things may glitch with it (like relationships etc) so save before doing this. I don't have any issues with it though. It doesn't diminish my love for these skin tones though! :) and Ok, will do! Thanks! Make sure your game is up to date. EA has changed a lot of CAS part coding since the initial release which has meant a few changes that mean newer content does not show up in earlier game versions. Skin colours is one example as the coding was changed when aliens were introduced with GTW. As for the difference, skin tone and skin details as much more complex then previous games. Before, they were all combined together. In TS4, skin colours are like a base colour that all the details are applied to as an overlay like cheeks, lips, abs, etc. So there are found under "Faces and Skin Tone" section rather then the "Skin Details" section. These skins are so amazing! Thank you! Hello, your skin looks so fabulous, but it doesn't show up in my game. Im sure its the latest version either. Do you have a solution? I honestly can't tell you why its not showing up in your game. I would suggest you check out the "Installing Content" menu link at the top of my blog to see if you can find an answer there. If you cannot make it work from there, I need more information as to what you did, step-by-step so i can determine the issue as simply saying "it doesn't show up" gives me no useful information to help you solve the issue.